I have to confess it has grown on me during the course of the afternoon. It's not my favourite, but I do quite like it now. It's different and I am thrilled to see the team has a title sponsor. I’ll wait until I see it in the sun. Seen worse, that’s for sure. I may soften my Williams criticism, when I see it on track, but I doubt I'll love it by any stretch of the imagination. So, C'mon Renault, how is your racing beast going to comb it's hair in 2019?? To update my initial reaction on the Williams shots above. I was searching for the low nose angle (which I usually do at this time of year for my car "paint jobs") ... and I found this image below. I will admit, I don't mind the front of the car's livery ... it's everything else that seems cluttered and lacks blending. I think it will look right when in the context of the FW42 as opposed to slapped onto last year's car. I think it's growing on me a little, like I say, I'm starting to like the front wing section and nose on "this" car, so once it's all finalised, maybe it will look 20% better? I wish all teams went with jet black and a team name on the rear wing ... I know, that's my paint head talking, I'll get there!! Was it worth rushing home from work Luke? Do you think this is a one time only RBR colour scheme and we can expect a different look at the 1st GP, or is it just a one year thing? Anyways it really is a big change for Red Bull. The Merc looks a lot like the Williams scheme in its colour proportions, maybe Paddy had some sketches of their scheme on his car seat when he took James Allison to Sunday lunch. All those hints and prophecies about moving away from silver are dashed. More black than I expected though. Yes, it is always worth rushing home from work To be honest my day was so quiet I was able to leave earlier and get home by lunch. All good! The Mercedes was never likely to be anything other than silver. The details on the engine cover are nice in photos, but will be lost on track. It's okay. Red Bull, one off... I think it is for today only. Red Bull are terribly dull with their liveries in season given their 'cutting edge' attitude they keep trying to peddle! I'm watching the Racing Point reveal live. It's still pink! Pix as soon as I can find one. The Racing Point unsurprisingly has an awful lot of the sponsors that were on the FW41 on it. You beat me to it, Luke! Well, at least nobody will have any trouble recognizing it on track. 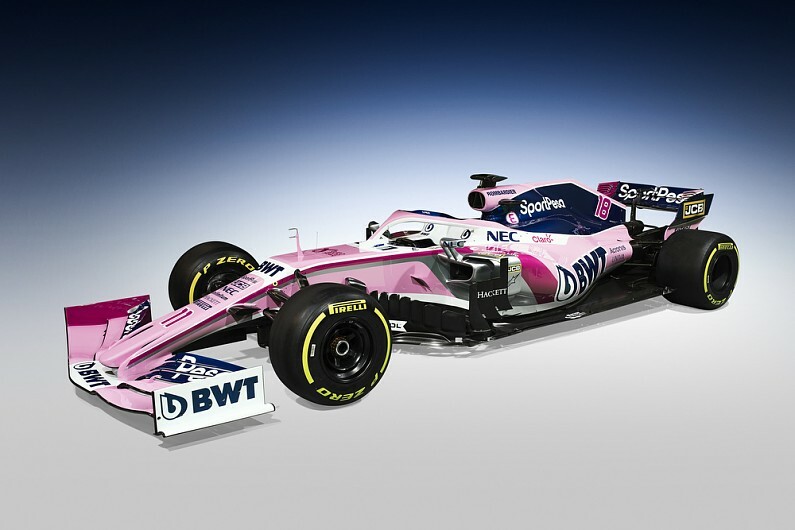 Well RP is not as pink as it was last term, I also detect a lot of black lower down and at the back a la Williams, maybe it's a group thing for Merc powered cars. They can't have all had Sunday lunch with Paddy.